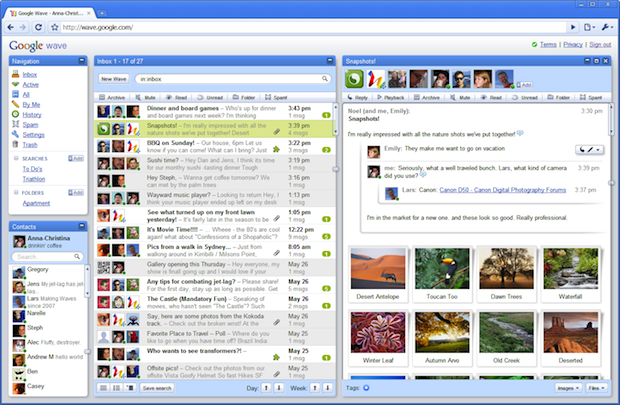 Google Wave was announced to great fanfare at Google’s I/O 2009 conference. It sounded promising, a melange of new-world communication protocols–somewhere between an email and a chat room, but more real-time than either. Could this be Google’s killer social media app, overtaking Twitter and Facebook? But the warning signs were evident from the start. Wave proved extremely difficult to explain. I found it impossible to describe what the service was in unambiguous terms. I found myself ignoring Wave in favor of traditional instant messaging and clearer, though less capable, media like Campfire chat. It required many suggestions on how to use it, and grew slowly. So it’s not surprising that Google officially axed the project today. Wave never took off in any significant numbers, in large part due to Google’s failure to position it properly. ZDNet notes that Wave might have lasted longer had it been integrated into Gmail, as Google Buzz was, rather than sequestered on its own page. I don’t know if that’s true–I think the product itself was just too complex to really catch on–but there’s a reasonable point to be made. Wave had potential that was never reached. Google will keep Wave live at least until the end of the year, and has already made the code behind it freely available. But the company has officially finished developing for the platform, and that very likely marks its death. So long, Wave. We hardly knew ye–and that was the problem.